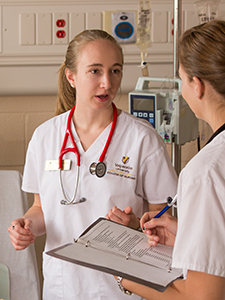 Emily Knippenberg ′16 is a nursing major, and Christ College is where she began to understand nursing as a vocation rather than simply a career. A Christ College course introduced Emily to the nexus of issues — biomedical ethics, cultural competency in the delivery of health care, and public health— that she now describes as a passion. After completing her bachelor’s degree in nursing at Valpo, she plans to pursue a graduate degree in public health. “Christ College really developed my sense of vocation,” she says. “Every course I take at Christ College feeds into that passion,” she adds, noting that the honors college’s interdisciplinary approach has allowed her to examine the issues that fascinate her from multiple perspectives. One of those perspectives has been the view from Latin America. Emily, who minors in Spanish, spent a semester of her sophomore year in Costa Rica, taking courses at the Valparaiso University Study Center in San José as well as the Universidad de Costa Rica. The demanding schedule of science courses required of a nursing major can make study abroad difficult to fit in, but Emily says that the “fantastic academic advising” at Christ College helped her formulate a major plan that accommodated what turned out to be a life-changing experience. During her time in Costa Rica, she completed an internship at a hospital, and during Valpo’s two-week Spring Break, she joined an annual service-learning and research venture that Valpo’s College of Nursing and Health Professions administers in conjunction with the University’s Study Center in San José. Between 20 and 25 Valpo students each year participate in the trip, serving clinics in urban Costa Rica and rural Nicaragua. During their week in Nicaragua, a small group of the students also conduct a research project in public health under the supervision of a professor in the Valpo School of Nursing and Health Professions. The Spring Break service project has had a profound impact on Emily’s understanding of the relationships among health-care providers, researchers, and patients. Thanks to Christ College’s Schweitzer Fellowship, which funds the participation of several Christ College students in the annual service/research trip to Central America, Emily was able to return for a second year to serve clinics and participate in research. She will likely be cited as a co-author in a research publication before she graduates. Emily, a native of Centennial, Colo., numbers 19 Valpo graduates — including both of her parents — among her family members. But from childhood through most of high school, she stubbornly insisted that she’d never join them. “My parents were great: they put no pressure on me,” she recalls, “but they did ask me to keep an open mind and just take a look.” She did, and she liked what she saw. “Christ College was an important factor in my decision to come to Valpo,” she says. Emily could hardly be more confident that she made the right decision: at Christ College, she has found not only a vocation, but the skills and confidence to pursue it.